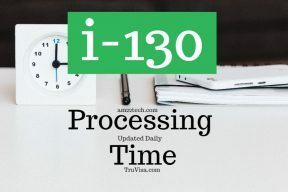 How long does it take for I130 to get approved for spouse is based on current processing time mentioned above at the USCIS service center. 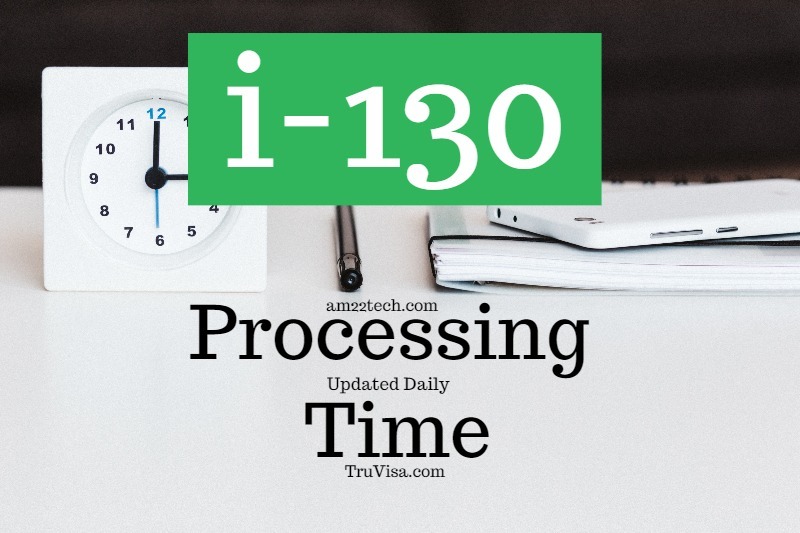 Family Green card form i 130 processing times are updated daily for 2018 using the official USCIS processing times and data shared by real applicants in various forums and trackers online. If your ‘case received date’ is before the date (worst case) mentioned above, you should raise a service request with USCIS to check why your case has been delayed. This could mean your case is taking longer than other similar cases and may be stuck in administrative processing. Next step after I-130 is filed? A Green card priority date (receipt date) is assigned by National Visa Center (NVC) on USCIS-approved i-130. A wait list is created with priority date cut-off and USCIS announces current cut-off dates in monthly Visa Bulletin. Family member is inside the U.S. If your family member is inside the U.S. at the time their priority date becomes current, they need to file Form I-485 Green Card application to change their status to permanent resident (green card). Family member is Outside the U.S. If your family member is outside of the U.S. at the time of priority date getting current, the NVC will send your petition and their visa number to the family members’ local U.S. consulate or embassy, which will contact the family member to come in and complete visa processing. Which USCIS service center is your case currently pending at? You can expect your I-130 approval by August 2020 end. And what if my spouse becomes a us citzen within two months? Hello, Inquiring about spouse visa for a US Citizen at texas center. The file was received by them on October 22 2018. Please advise when i should be getting an update on when they will start the reviewing? You can expect your I-130 approval by May 2019 end. What would be the earliest it can come? Nobody can guess the earliest time. If i do say a date and it does not get approved by that date, you will blame me for the wrong date. I just gave you the date based on average processing time. will it be in May for sure? April will be 6 months. When i give a tentative month. it means that your result can come on or before that date/month. There is no hard and fast rule to stop your case approval. Hello, My receipt number was 09/25/2017 spouse. California Service Centre. My husband was green card while filing i-130 and September 2018 he became US citizen. How long will it take for Visa Interview? Has your I-130 application been transferred to any other center after your spouse upgraded it for US citizen? I do not have data to estimate the date for you case then. Sorry. My situation is the following: I submitted the I-130 form for my husband as a permanent resident in June, 2018, I became a citizen in October, 2018, sent in my naturalization, I got a receipt (still in October) from USCIS that they changed my case and he’s moved into the immediate relative of a US citizen. We still didn’t get any other notice, how much longer will it take approximately for the petition to be approved? I live in Washington state. At the California Service Center. I do not have data about California center for US citizen case. Than could you please provide me with information about where I could find out? Who or where should I contact / look for information? I do not have data about Citizens filing for spouse at California center because USCIS does not share it. I am not sure if there is any way that you can find it online. You can expect your I-130 approval by Feb 2021 end. You have to wait for the I-130 approval first. You cannot do anything unless the I-130 has been approved. Hi, How are you sir ? I am an US citizen and filed i-130 for my wife. The priority date is ‘Sep 4, 2018. How long it will take for the i-130 to be approved? Which service center is it? You can expect your I-130 approval anytime now. You are pretty close. What is the person’s status in USA who filed this I-130 application for their children? Is the parent US citizen or Green card holder? You can expect your I-130 approval by Sep 2020 end. Please check other scenarios and dates above your case. Hola, buenas tardes, tengo una pregunta, mi fecha de prioridad es de septiembre 2017 oficina en california, soy residente aún no me han aprobado la i130 y el boletín de visas ya va en marzo de 2017, mi pregunta es debo tener en cuenta este boletín? Porque siento que el boletín está avanzando mucho y la i130 aún no ha sido aprobada y he escuchado que los 6 pasos después de la aprobación toman 90 días. Este boletín de visas debo tenerlo en cuenta también? Es para la gente que va a recibir su cita o es para ingresar a los 6 pasos, Gracias por aclararme la duda. El boletín de visas aparece en la imagen solo después de que se apruebe su I-130. Hello, my receipt number was 09/27/2017, l.130 spouse California service center how long it takes to have an answer. How long does it take to bookmark the visa interview? What is your spouse status in US: Green card or US citizen? Green Card. And my birth country is France. You can expect your I-130 approval by July 2019 end. This is step 1. Once your I-130 is approved, the second step is Green card interview which happens based on visa bulletin dates. As per visa bulletin of Mar 2019, USCIS is giving green cards to people whose priority date is 08 JAN 17 or earlier. Your priority date is 27 Sep 2017. I mean, if everything goes well, will I be in the US by October? I don’t think October would be possible. It depends on how fast the visa bulletin moves ahead. Until when do you think until what month I can be in the US? I do not have an estimate for your green card at this time. US Citizen applied for i130 spouse visa in NOV 18. She has a travel B1 visa from earlier but is currently unemployed. Can she come visit ? No idea about approval times either. She can travel to US on B1 visa but an entry may be denied as her immigration application is pending. B1 visa does not allow immigration intent. Oh okay. The Texas center lists processing times as 7-10 months. Is that until the approval is given or is there additional wait time for interview date? The first step is to get I-130 approval and then step 2 is to get Green card interview date. Green card interview can only happen after step 1 has been completed.